Last week Riyadh laid down a list of 13 demands for Qatar, included the closure of Al-Jazeera, a downgrade of diplomatic ties with Iran and the shutdown of a Turkish military base in the emirate. Washington: Top Gulf diplomats were in Washington Tuesday as US Secretary of State Rex Tillerson sought to help resolve the stubborn Qatar crisis, amid concerns that Saudi Arabia's unyielding stance could foil the effort. 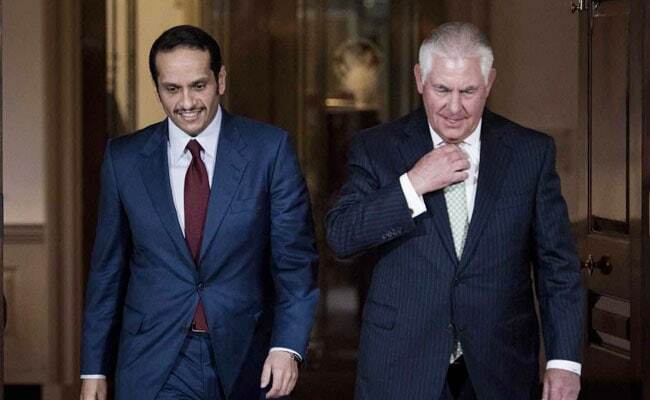 With a one-week Saudi deadline looming for Qatar to meet its demands, Tillerson had talks with Qatar Foreign Minister Sheikh Mohammed bin Abdulrahman Al Thani. He quickly followed that with a meeting with Kuwait Minister of State for Cabinet Affairs Sheikh Mohammad Abdullah Al-Sabah, whose country has taken on the official role of mediator. And he was planning to meet in a working dinner late Tuesday with the Kuwaitis and UN Secretary General Antonio Guterres, who has offered to help resolve the row. But Saudi Foreign Minister Adel al-Jubeir, also in Washington, was unbudging over the three-week-old squabble, which has left Qatar, a US ally, isolated under a trade and diplomatic embargo set by its Gulf Arab neighbors. "Our demands on Qatar are non-negotiable. It's now up to Qatar to end its support for extremism and terrorism," Jubeir said via Twitter. With the support of the United Arab Emirates, Egypt and Bahrain, the Saudis announced on June 5 they were suspending all ties with Qatar, accusing it of support for extremist groups -- a claim Doha denies. They closed their airspace to Qatari carriers and blocked the emirate's only land border, a vital route for its food imports. The United Arab Emirates warned that Qatar should take the demands seriously or face "divorce" from its Gulf neighbors. The dispute between two groups of allies -- Turkey and Iraq have backed Qatar -- has laid down a hefty challenge for Tillerson, a seasoned oil executive but new to statecraft. While initially stepping back from what it viewed as a regional spat that would sort itself out, Washington has accepted that it will have to take an active role in resolving what has the makings of a foreign policy disaster for the young government of President Donald Trump. Washington has close economic and security ties with both sides of the quarrel. Qatar is home to the largest US base in the region, Al-Udeid. Bahrain is home to the US Navy's Fifth Fleet. And the US and Saudi militaries work closely together as well. Kuwait is the official arbitrator for seeking a settlement, and after meeting al-Sabah, Tillerson pledged his support for its lead in talks. During their meeting they "reaffirmed the need for all parties to exercise restraint to allow for productive diplomatic discussions," according to spokeswoman Heather Nauert. But the US will be central to finding compromises that would do little damage but allow each side to claim a win, said Hussein Ibish, a scholar on Gulf affairs at the Arab Gulf States Institute in Washington. "It's an all-out struggle of wills," he said. "The way out for both sides is a kind of an American mediation which is face-saving for everybody." The United States has cautioned that some of the demands would be difficult for Qatar to accept, asking the Saudis for a clear list of grievances that are "reasonable and actionable." Nauert said that talks would continue through the week, but added the Saudi demands remained "challenging" for Qatar. "Some of them will be difficult for Qatar to incorporate and to try to adhere to," she said. "We continue to call on those countries to work together and work this out."